temperature, the surface will quiver slightly. 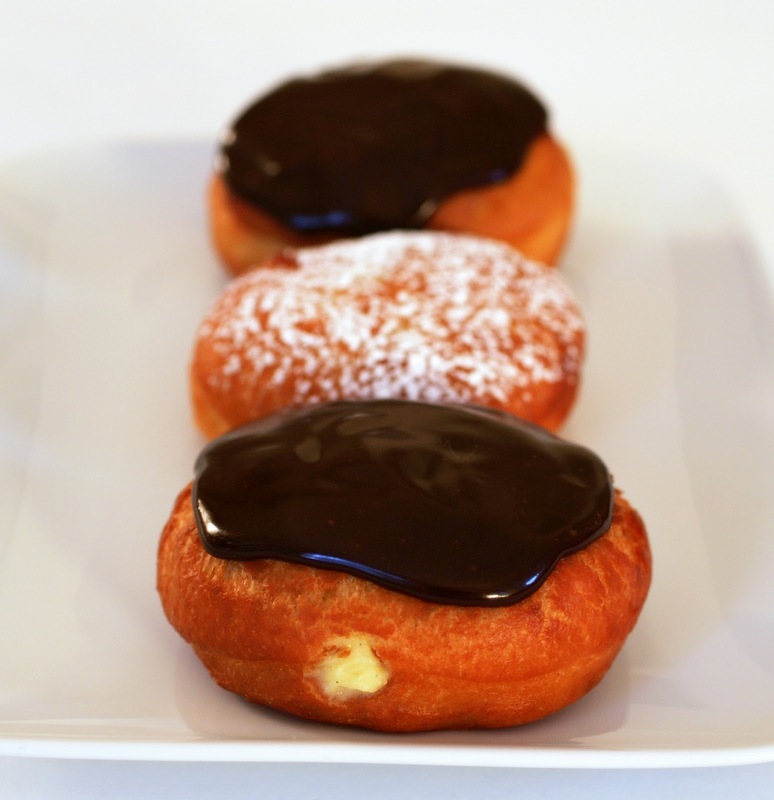 If you want to simplify the recipe, skip the chocolate glaze and dust the doughnuts with confectioners’ sugar. They’ll still be good, but they won’t be as good, trust me. 1. In a saucepan, combine the sugar, 1 1/2 cups of the milk, and the vanilla bean. Cook over low heat, stirring constantly with a wooden spoon, until the sugar is dissolved. Raise the heat and scald the mixture. 2. Meanwhile, place the cornstarch in a medium bowl. Using a wire whisk, gradually whisk in the remaining 1/2 cup milk until smooth. Add the yolks and whisk until well blended. 3. Slowly pour 1/3 cup of the hot milk mixture into the yolk mixture, whisking constantly. Gradually whisk in the rest of the hot milk. Return the milk-yolk mixture to the saucepan and bring to a boil over medium heat. Boil gently for 1 minute, stirring constantly. 4. Remove from the heat and whisk in the butter. Pass the mixture through a sieve into a bowl. Cover with plastic wrap, placing directly onto the surface, and refrigerate until chilled. 5. Place the warm milk, yeast and 1 teaspoon of the sugar in the bowl of an electric mixer. Stir the yeast into the mixture and and let stand for 10 minutes, or until foamy. 6. Add 1 cup of the flour and, using the paddle attachment or beaters, beat on low speed for 2 minutes to form the sponge. Remove the bowl from the stand, cover with plastic wrap, and let the sponge stand at room temperature until well risen, about 30 minutes. 7. In a medium bowl, whisk the remaining 1 3/4 cups flour with the cardamom, nutmeg, and salt; set aside. 8. Return the bowl containing the sponge to the mixer stand. Using the paddle attachment on medium speed, add the eggs and mix until incorporated, then beat in the remaining sugar. Add the butter, 1 tablespoon at a time, beating until each tablespoon is absorbed before adding the next. Add the flour-spice mixture and beat on medium speed for 5 minutes. The dough will not form a ball. It will be soft and part of it will wrap itself around the paddle. 9. Scrape the dough into the a well-buttered bowl and turn as needed to coat all sides with the butter. Cover the bowl with buttered plastic wrap, buttered side down, and let the dough rise in a warm, draft-free place for about 1 hour, or until it has slightly more than doubled in volume. 10. Turn out the dough onto a lightly oiled work surface. Using your hands, gently press down on it to deflate it and flatten it evenly to no less then 1/2 inch thick. Cover loosely with plastic wrap and let dough rest for 5 minutes. 11. Line a baking sheet with parchment or waxed paper. Using a floured 2 1/2-inch biscuit cutter, cut out 14 dough rounds. Gently transfer the rounds to the lined baking sheet, reshaping them if necessary. Space the rounds at least 1 inch apart to allow for expansion. Let rise for about 30 minutes, or until almost doubled in size. 12. While the doughnuts are rising, pour oil into a deep-fat fryer or large straight-sided saucepan to a depth of 2 to 3 inches. Heat the oil to 360°F. Line a baking sheet with paper towels. 13. 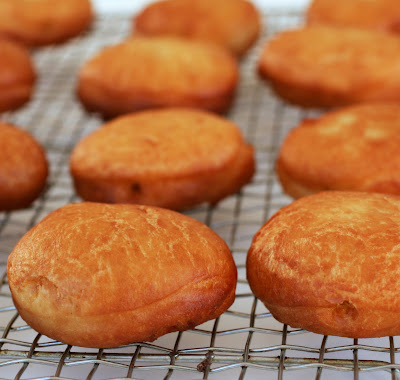 Fry the doughnuts, 3 or 4 at a time, for about 1 minute, or until golden brown on the first side. Turn and fry on the second side until golden brown. It may take slightly less time for the second side to cook than the first. The midline of the doughnut will be lighter than the rest of it, which is characteristic. Using a slotted spoon, transfer the doughnuts to the paper towels to drain, then place on a wire rack to cool. 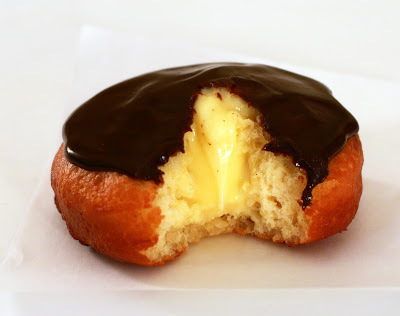 As soon as the doughnuts are cool enough to handle, use a long, thin, plain pastry tip to poke a hole through the midline to the center of each doughnut. Let cool completely before filling. 14. 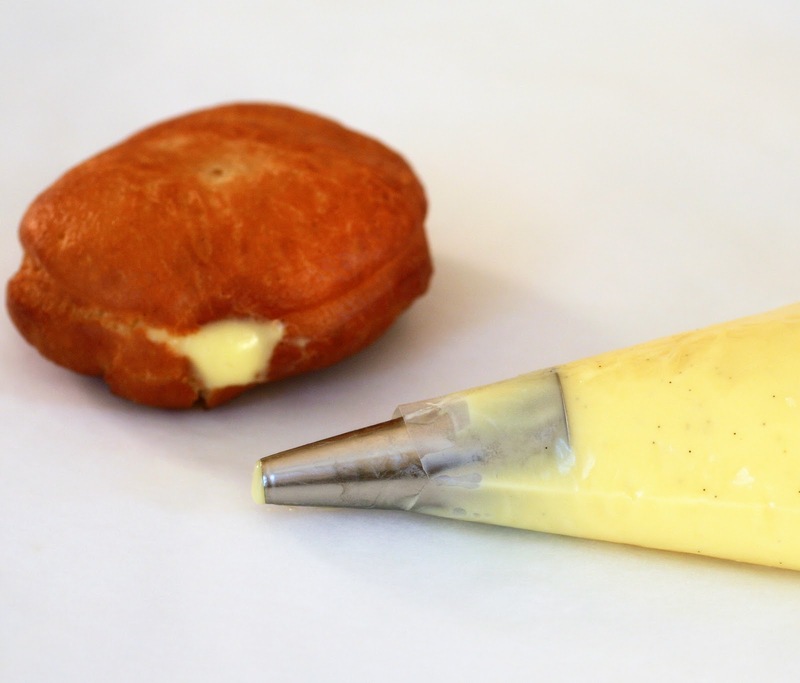 Remove the vanilla cream filling from the refrigerator and beat with an electric mixer on medium speed until smooth. 15. Scrape the cream filling into a large pastry bag fitted with a medium plain tip (such as Ateco #2). Pipe the filling into the hole in the middle of each doughnut until the doughnut feels full. Wipe off any excess cream. Return the filled doughnuts to the rack as they are filled. 16. Place the chopped chocolate in a medium heatproof bowl. 17. Combine the water, corn syrup, and sugar in a heavy-bottomed, medium saucepan. Place over low heat and cook, stirring constantly with a wooden spoon, until the sugar is dissolved. Raise the heat and bring to a full boil. 18. Pour the hot syrup over the chopped chocolate. Let stand for 3 minutes to melt the chocolate, then whisk gently until smooth. Whisk in the butter. Let the glaze cool until it starts to thicken slightly, stirring occasionally. 19. Spread a scant tablespoon of chocolate glaze over the top of each doughnut. Place the glazed doughnuts back on the rack and let stand until set. 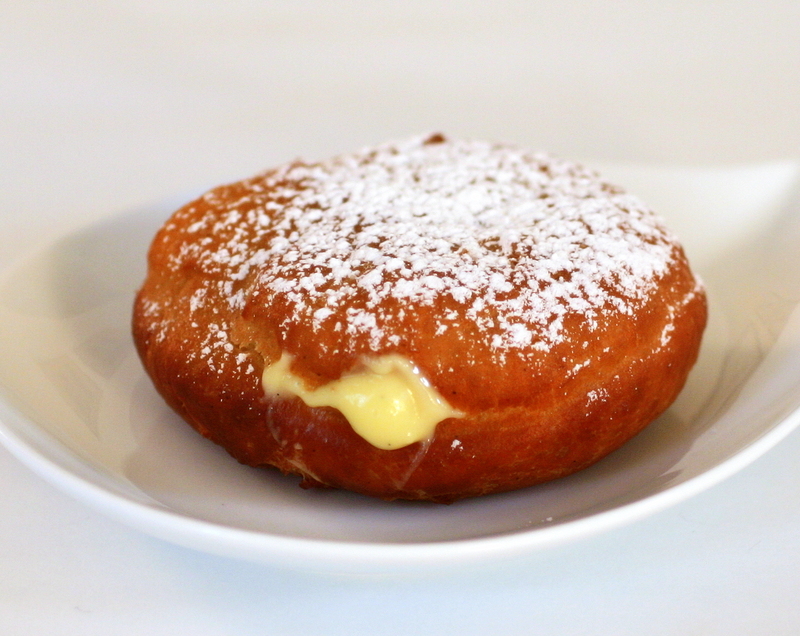 The doughnuts are best served within a few hours.